The Beastie Boys are considered very influential in both the hip hop and rock music scenes, with artists such as Eminem, Rage Against the Machine, Hed PE,Limp Bizkit, Sublime, and Blur citing them as an influence. 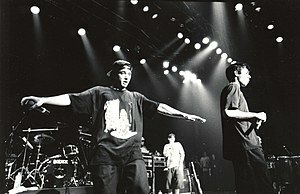 Beastie Boys have had four albums reach the top of the Billboard album charts (Licensed to Ill, Ill Communication, Hello Nasty and To The 5 Boroughs) since 1986. In the November 2004 issue, Rolling Stone named "Sabotage" the 475th song on their 500 Greatest Songs of All Time list. In their April 2005 issue, Rolling Stone ranked them number 77 on their list of the 100 Greatest Artists of All Time. VH1 ranked them number 89 on their list of their 100 Greatest Artists of All Time. On September 27, 2007, it was announced that Beastie Boys were one of the nine nominees for the 2008 Rock and Roll Hall of Fame Inductions. In December 2011, they were announced to be official 2012 inductees.